There are relatively few POS systems that offer anything close to this company’s impressive range of services and applications. Customers love that they come packed to the brim with more than 100 incredibly useful features, such as menus that can be customized in an instant and real-time updating of tables, seating, and customer profiles. Combine this with Upserve’s amazing analytical capabilities, and you have a POS system capable of handling all the workload of a busy restaurant - and more - with ease. As many hospitality businesses are seasonal, this company offers a seasonal operation feature. Instead of being charged in full while their businesses are inactive, customers only need to pay a minimum monthly service fee. Being a cloud-based POS, managers are also able to check important shift data, sales, and employee performance from anywhere, as long as they have an internet connection and an iPad or iPhone. Created by former hospitality professionals, Breadcrumb POS by Upserve has been exclusively designed with its end users in mind: Restaurant managers and servers that need a fast-working, simple system. Their point of sale service is extremely capable of handling the unique workload of hospitality businesses. Breadcrumb’s point of sale system integrates into existing and new hospitality businesses with ease. All that is needed to get started is for a customer to open an account via the website and to ensure there is a stable WiFi connection throughout the entire premises. Setup generally takes a couple of days until hardware arrives and everything is installed correctly, however they can offer same-day setup under certain circumstances. Additionally, this company does not charge for setup and installation, something which is welcomed by many business owners. Regular, complimentary software updates ensure that Breadcrumb’s service runs at optimum speed and efficiency at all times. And the combination with Upserve’s incredible analytics and reporting makes this a very well-rounded POS. Though there is a great deal of information available via their website, no specific details regarding the application process have been provided. Customers interested in Breadcrumb’s point of sale service are first advised to begin with a 14 day free trial, which may begin after a client opens an account and enters some basic information. The website is secure, and customers can breathe easy knowing that their details are kept safe via encryption. If a client decides not to continue with their services following their 14-day free trial, they permanently delete the customer’s account information, so that none of it is stored indefinitely. What’s Unique About Breadcrumb POS? One of the most unique features of this POS is their Offline Mode, which is an incredible lifesaver for customers and their businesses. If, for whatever reason, there’s a power outage or the internet connection gets shut down, their point of sale enables servers and staff to continue to collect encrypted credit card details and store them securely on its system. Once connections have been restored, the system will automatically process the outstanding payments. This is a crucial feature as one of the downsides of using a cloud-based POS is that if the internet or power is cut, the entire system usually becomes inoperable. This is thankfully not the case with Breadcrumb POS. This service also offers a very competitive payment processing plan. Card swipe costs are calculated using Interchange Plus pricing, with a minimal 0.10 per transaction fee. However, there is no further information on their website regarding per transaction costs for EMV (chip) dips, checks, or debit cards. Additionally, as Breadcrumb is currently owned by Upserve, their customers are able to access Upserve’s highly detailed analytics, reporting, and inventory features. There have been many ups and downs over the last few years with regards to Breadcrumb’s customer support. Under Groupon, many of this company’s clients were frustrated with their customer service offering. To date, numerous poor reviews can still be found online - however, it is vital to note that the majority of these were posted by clients well before the recent sale to Upserve. 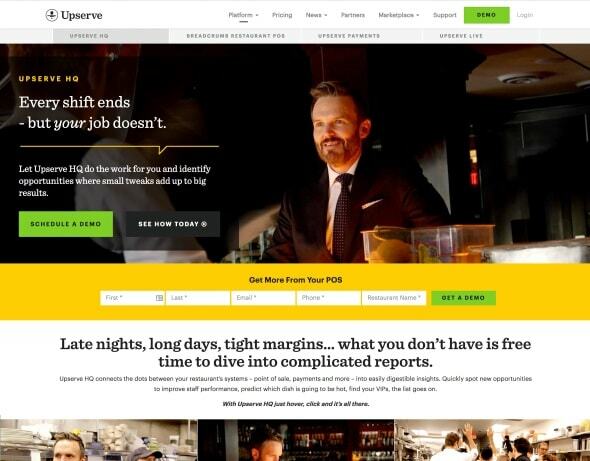 Since the switch in 2016, Upserve has toiled long and hard to improve Breadcrumb POS’s customer service, and now offer full support - 24/7/365 - through a variety of methods. Support can be accessed immediately via their telephone number, or by simply sending an email to their support team. Additionally, Breadcrumb provides an impressive range of troubleshooting and FAQ pages via their dedicated support page - meaning that clients can easily solve common problems quickly and painlessly. Grouped by clear headings, their articles and blog posts take readers through everything from setup and installation, to billing, taxes, and even calculating overtime. What’s more is that Breadcrumb also has numerous informative videos which clearly demonstrate, step by step, how to carry out certain POS functions. Upserve offers more pricing options than most for both software and hardware, including the ability to purchase hardware outright, monthly financing, and Prix Fixe which is a service offering that eliminates the need for high upfront capital expenditures for hardware or software. 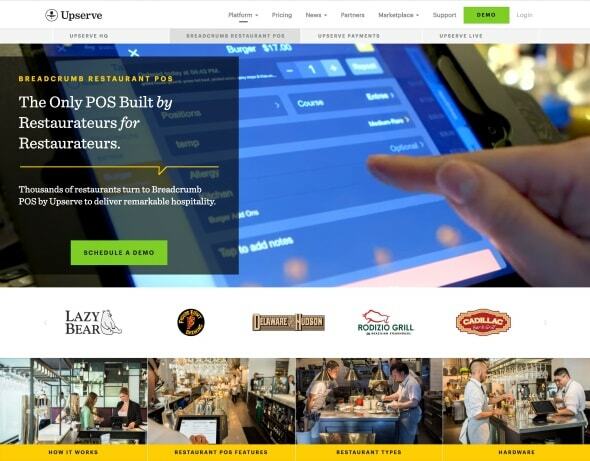 Upserve added Breadcrumb POS into their Restaurant Management Platform - a single solution to help restaurateurs run their most critical operations in the restaurant. The entire Platform includes Breadcrumb POS, Upserve HQ (analytics and reporting), Upserve Live (Mobile app), and fair rates for Upserve Payments (Payment Processing). 1. Monthly Contract. The standard is a 3 year contract paid each month. You can, however, get a discount for paying the annual contract sum in advance. And if you'd rather not be tied into a contract for a large duration, they do offer month-to-month contracts, but at a premium. Hardware can be purchased through their store site. 2. Monthly Contract with Hardware Included. This pricing is determined based on your needs and includes the hardware for your device amortized across your contract duration. This package is great if you're looking to reduce upfront hardware costs. So to recap: If you want to get the best POS and Restaurant Management solution on the market, you'd be going with Upserve Pro at a monthly cost of $249/mo. which includes a single Breadcrumb POS register, 1 EMV reader, and unlimited POS integrations (plus hardware and additional terminal licenses costs if you chose the option without hardware included). Payments start at Interchange + a flat rate per transaction meaning you keep the upside as your business grows. 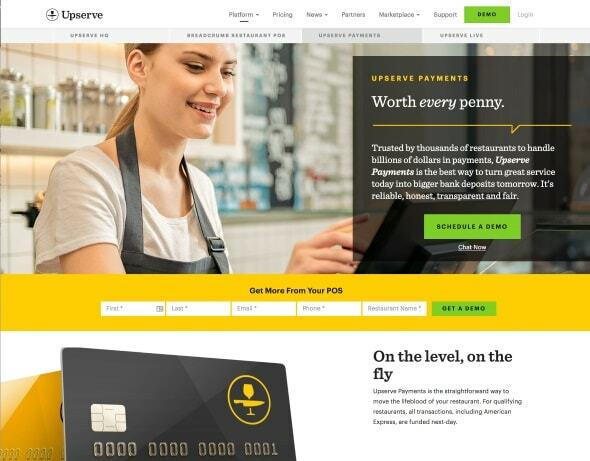 In a refreshing twist, Upserve offers potential customers the unique opportunity to read through their entire Merchant Agreement via their website. This transparency is highly invigorating and demonstrates clearly that they have nothing to hide - whether in its fees and charges or contract terms and arrangements. Upserve makes sure that all the legal aspects of its services are spelled out in great detail, including what happens if the system enters "Offline Mode" and that they reserve the right to suspend operations should they suspect fraud. Issues with hardware purchases, and returning faulty hardware are also diligently covered, ensuring that potential customers are fully aware of all vital points before engaging their service. 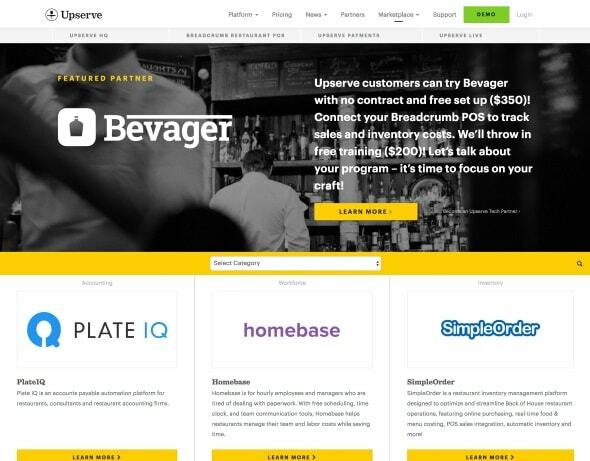 Since Upserve delivers everything as a Platform, it's hard to remove one solution from the mix since each Platform solution includes payments, Breadcrumb POS, and Upserve HQ. As previously stated, there are two options for purchasing the Breadcrumb POS - hardware excluded and hardware included. If customers wish to cancel their monthly plan, they must look at their contract for duration length or may incur expenses for canceling the contract earlier than contract end date, so it is highly recommended that customers review these terms and conditions thoroughly before signing. These fees for early termination are pretty standard with any contract. 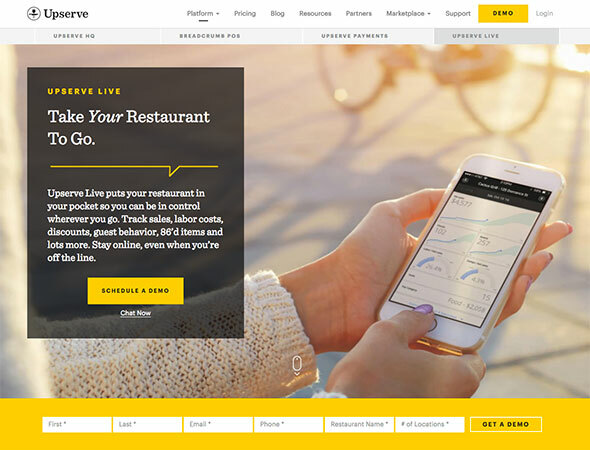 Upserve offers free installation, free 24/7 US-based support and free software updates. From basic features such as easy menu customization, through to in-depth, detailed analytics, Breadcrumb does a lot of heavy lifting, lightening its customers of many day to day burdens. While the past few years were somewhat turbulent under Groupon’s ownership, since teaming up with Upserve, this company’s reporting capabilities and customer service department have improved immensely. As time passes, we expect to see the full potential of the merging of Breadcrumb and Upserve, which will make it an very competitive and highly desirable POS system. Originally founded by Seth Harris in 2011, Breadcrumb POS made waves in the hospitality industry with its friendly interface and streamlined processes and grew its customer base quickly. After a short run, in 2012 the company was acquired by Groupon, whom it remained for the next 3 years. Following on from a strategic partnership formed in 2015, Upserve purchased Breadcrumb from Group in May 2016. Since then, Upserve has continued to improve upon Breadcrumb POS’s existing features, and payment processing services, and has further expanded its customer service offering. Together, they now serve more than 6,000 restaurants in every U.S. state.